Jordan Ash dives for a loose ball. Ash and the Wildcats will face off against No. 2 Michigan State on Saturday. It was Saturday, February 17, when Michigan State — led by star Lee Lafayette — rolled into Chicagoland and were promptly dealt a 69-61 loss by Northwestern. The year was 1968. The win upped the Wildcats’ all-time record against the Spartans to 20-18. Since then, NU has lost a whopping 71 of 89 meetings against Michigan State, and when the No. 2 Spartans (25-3, 13-2 Big Ten) visit on Saturday afternoon — 50 years to the day since that 1968 game — they will be massively favored to continue that dominance. The Cats (15-12, 6-8) are coming off a nightmarish two-game stretch: they were dominated by a 6-9 Maryland team in Big Ten play last Saturday, then collapsed down the stretch in a humiliating defeat against 3-12 Rutgers on Tuesday. Adding to their woes is an apparent shoulder ailment that took senior guard Bryant McIntosh out of the most of the second half and the entirety of overtime Tuesday. 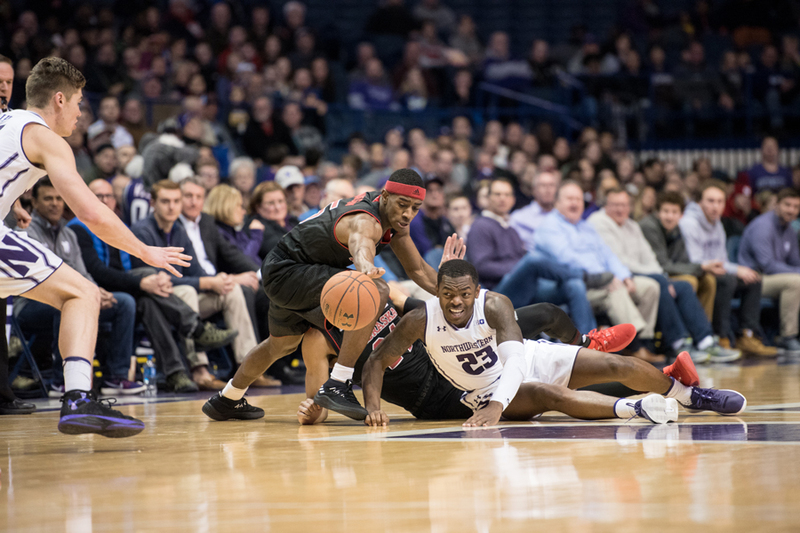 McIntosh’s status for Saturday is unknown, and without him on the court, NU has shown startlingly little ability to generate productive offense. Michigan State, meanwhile, enters the weekend riding a nine-game winning streak dating back to Jan. 19 that has lifted it to No. 2 in the national rankings. It also most recently played Tuesday, hammering Minnesota by an 87-57 score. The Spartans are led by athletic, versatile forward Miles Bridges, whose 17.3 points-per-game average tops even Lafayette’s 16.9 average back in 1968. He’s a projected top 10 pick in this spring’s NBA Draft and ranks second in rebounds and steals in addition to his runaway lead in scoring. Saturday will be Bridges’ first-ever game against the Cats; the sophomore missed last year’s game against NU. His team nevertheless comfortably handled that contest, topping NU 61-52 in East Lansing thanks to big nights from guard Cassius Winston and center Nick Ward — two players who remain important contributors beyond Bridges. Michigan State has played a number of closer-than-expected games on the road this season, but nonetheless improved its record away from home to 6-1 by beating the Golden Gophers. After that game, Winston told the Detroit Free Press that “being on the road in hostile environments … doesn’t really bother” the team. The Cats will certainly have their work cut out for them to add a second loss to that record, based on both the respective qualities of this year’s teams and on history. NU has lost eight straight against Michigan State — with last year’s nine-point deficit being the second-closest of those eight games — and 24 of the 26 since the 2003 season. The luck of February 17 from 50 years ago will likely take a miracle to recreate.